While not all classes have off-specs, most of them do and it never hurts to have your off-spec set geared and ready to go in the event that you are needed to fill a role. Making sure you know how to play your off-spec isn’t a bad thing either! I’ve seen many people roll on gear for their off-specs only to never see them played. If nothing else, it could make your life easier to find groups. Gearing up characters can be a pain in the rear and nobody wants to have to do it twice for a second spec, but you never know when having that second spec will be useful. These days it seems like tanks are in demand and if you happen to be one of those DPSers who can have a tank off-spec, I can tell you from experience that it definitely makes finding groups extremely easy. This goes for those DPSers who can have a heal off-spec, though to a lesser extent. It still beats having to wait in the group finder for hours as a DPS! While healers and tanks are always in demand, you’ll occasionally see groups in general chat on the fleet looking for DPS to fill a pug. Here is where you healers and tanks can take advantage of your extra gear you have sitting around gathering dust. Now I’m sure you have heard stories of how certain classes can’t DPS very well (ie: DPS Operative/Scoundrel and Juggernaut/Guardian), but it honestly depends on the skill of the player. Don’t let the hearsay discourage you. These advanced classes may be difficult to DPS well, but with the right person on the keyboard they can hold their own. For you Sniper/Gunslinger and Marauder/Sentinels, you may be limited to DPS, but there are some situations and fights where one spec may be more useful than another. The Mara/Sent, for example, have specs for burst damage verses damage over time abilities. For those long fights where you’re going to have to be on and off the boss, you’ll want the DoT bleed spec to make sure you’re still doing damage while moving or switching targets. Other fights it may be better to spec into burst damage where movement isn’t as important, but burn DPS is. Of course, if nothing else, you can always keep a PvE and PvP spec option. A handy tool to have is the Legacy Character Perk for field respecs. 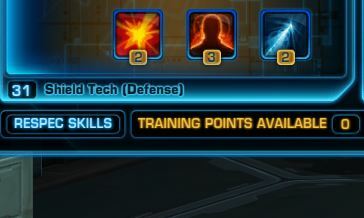 If you haven’t seen the ability, you’ll have to purchase it per character from your Legacy window. 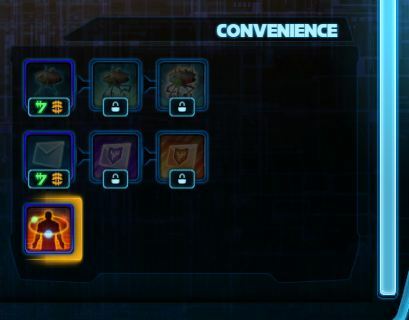 It costs 200,000 credits or 360 cartel coins to purchase, but it’s very useful if you are one of those who tend to respec often. Don’t forget that if you’re a subscriber respecs are now free! Now only if we can get Bioware to let us save the specs that we set. I get tired of clicking up skill trees every time I have to respec. Some of you may feel that it is just easier to use another character to play the role that you want and you may have a point. Personally, I tend to play one or two characters so being able to do multiple roles with them allows me to fill in for whatever operation group needs bodies. Unfortunately, it does force me to carry around an extra set of gear (14 slots) in order to do this. Having to carry around the off-spec adrenals and stims also tend to fill up your inventory slots rather quickly. Still, it’s a small price to pay and can definitely come in handy on those slow nights standing around the fleet.